THE STORY - In the wake of Sept. 11, Capt. Mitch Nelson leads a U.S. Special Forces team into Afghanistan for an extremely dangerous mission. Once there, the soldiers develop an uneasy partnership with the Northern Alliance to take down the Taliban and its al-Qaida allies. Outgunned and outnumbered, Nelson and his forces face overwhelming odds in a fight against a ruthless enemy that takes no prisoners. THE GOOD - Horses in modern day combat is quite fun to see. ​It’s very difficult to watch any war film after watching “Dunkirk” earlier last year. Where that film presented the war genre in an entirely new and fresh light, “12 Strong” (Or “The Declassified True Story Of The Horse Soldiers”) brings us back to a style of filmmaking and storytelling that dots the familiar “I’s,"crosses the “T’s” and checks off every box. The only unique element to the film is the presence of the horses and their use within the combat scenes. However, instead of writing a traditional review of this film, I’m going to try something different. Immediately following the September 11 attacks on the United States, “12 Strong” tells the story of the first 12 men sent in by the United States into Afghanistan to strike back at the Taliban. The team consists of Captain Mitch Nelson (Chris Hemsworth), Chief Warrant Officer Cal Spencer (Michael Shannon), Sergeant First Class Sam Miller (Michael Pena), Sergeant First Class Ben Milo (Trevante Rhodes) and a few others. As they invade Afghanistan, they must meet up with General Abdul Rashid Dostum (Navid Negahban) and form an uneasy alliance with him and his men to accomplish their goal and return home safely. Great sound mixing should be a given for a war film. Loud gunfire, explosions, men shouting, horses running, all of this should be a sound mixer’s dream. Instead, the final climatic set piece is nothing but a bunch of noise overlapped on top of each other, creating a headache-inducing experience that pummels the brain instead of engaging it. Fire that does not look like real fire. Smoke that does not look like real smoke. And one very distracting close up of Chris Hemsworth which must’ve been a pick-up shot because there is no reason why I should be able to detect the artifacts of green screen around his head in an important dialogue scene. Navid Negahban does what he is required to do in the role of General Abdul Rashid Dostum. He creates a likable character who grows to respect our hero as a fellow leader, all the while feeding him words of wisdom in nearly every scene they share. After a while, his monologues on leadership, life in Afghanistan and everything else in between becomes laughable when they are the only types of lines he has to act out. What do we know about these characters? Other than the fact that they are played by some famous actors we recognize, literally nothing. Oh wait a minute, one of them has nice, flowing, golden hair that the boys like to make fun of, so I guess there is that for one of them. There is a distasteful and poorly executed scene of non-sensical violence whose sole purpose is to make us hate one Taliban leader in particular so that when the good guys show up, we have someone on the other side to actively root against instead of a random assembly of Taliban fighters. There’s one scene where Captain Nelson is going over the plan of how the 12 men are going to fight the Taliban over the terrain, and how they’re going to split up and take this flank etc. This is all well and good but Rasmus Videbaek’s camera never expertly conveys that sense of geography and scale to us when we get to the actual battle itself. Hemsworth has proven that he is so much better playing goofy roles in films such as “Thor Ragnarok” and “Cabin In The Woods” but when he tries to get serious, the results are usually more miss than hit. He’s supposed to be playing a leader who lacks combat experience, yet because of his confidence, his men follow him anyways. So what does he have to prove to General Dostum and by extension, the audience? Turns out nothing really as whatever obstacles are put in front of Captain Nelson, both externally and internally, are never fully dwelled on and are dealt with swiftly, so why should we care? An actor of his caliber is being totally wasted here with no characterization or much of anything to do. There’s a whole section of the film where Shannon is held back at a rendezvous point because there are not enough horses for the men to travel over the terrain with and we lose him for a good chunk of the movie. Not only does he look out of place, he looks like he doesn’t even want to be there. One thing you can expect from any military film based on a true story is that when the credits roll, that’s when the emotion swells. Text over black, photo’s of the real-life people, uplifting music. We get it. We’ve seen it before. Maybe it was the fact that “Dunkirk” showed us that you can put together a great war film with a PG-13 rating but my overall stance on war films now is you either go hard with the blood and gore and show us that war is hell (I'm looking at you "Hacksaw Ridge") or don’t even bother at all. Ah yes. A huge pet peeve of many. The female parts in this film are mostly regulated to the wives of the men fighting overseas and of course, we see them at home before the fighting starts, upset that they have to see their men go off and fight this war and then we have to at least cut back to them once to see them watching the tv, looking concerned or something. Because they were cast and written into the script they have to do something right? Like the violence in the film, either go all the way and fully develop their characters/roles or don’t include them at all (And the latter option, is not the better option of the two). Tired? I know I am. 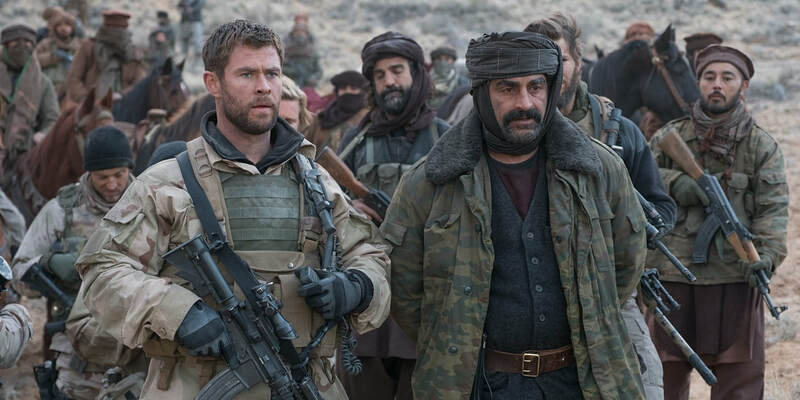 While I may never return to this review format again, I hope it was enough to convince you that “12 Strong” is not presenting you with enough compelling reasons to want to see it but with 12 reasons as to why you should avoid it. But hey, at least there are horses and explosions! Right? America? Am I right…?